The B2 Gift Voucher (the “Voucher”) is a priority of GPCM Group Co., Ltd. (the “Company”). B2 Gift Voucher costs 550 baht per voucher, 2,625 baht for 5-voucher package and 4,900 baht for 10-voucher package. (no buying limit for each customers) The company reserves the right of B2 Gift Room Card's payment to be paid via credit card and bank transfer only. The Voucher is not valid on any stay from 25 December 2018 to 1 January 2019. The valid Voucher must be presented each time upon check-in at the front desk on your arrival date. The hotel may not accept your accommodation reservation relating to the Voucher if the Voucher cannot be presented upon check-in, and then the full payment must be made for the accommodation booked. One gift voucher is valid for a reservation of Superior Room, Superior Garden View and Superior City View equal to the room rate less than THB 1,000 on the date of stay, and is valid ONLY 1 room per night. For Superior or Superior Garden View room type, the additional charge of 40% will be incurred if the room rate during the stay starts from 1,000 baht per room per night. Reservation and stay period of each Voucher is subject to the Conditions of Issue the Voucher. The Voucher is valid only for the expense of the guest room, not include food and beverages, gratuities, incidentals, or other hotel services. Incidental charges are the responsibility of the guest and these charges are to be paid directly to the hotel prior to check-out. The voucher will be sent to your preferred mailing address within 7 - 14 business days after purchasing. When ordering a Gift Certificate, you should ensure to enter the recipient’s email address correctly. Any accommodation reservation relating to a Gift Voucher issued for a package of accommodation, must be made directly through the B2 Call Center at least 7 days in advance. The company reserved the right to make a reservation via B2 Call Center to those who purchased and received B2 Gift Voucher only. Any accommodation reservation relating to the Voucher is non-refundable, non-cancellable, cannot be amended and may not be combined with other select promotions, offers or discounts. The hotel reserves the right to not accept any accommodation reserved by the Voucher if the hotel rooms are fully booked and/or any accommodation reservation did not make directly through the preferred booking channel as prescribed. Each B2 Gift Voucher has an expiration date and the Conditions of Issue which may be changed from time to time at the sole and absolute discretion of the Company. The expiration date can be found on the Voucher. The Voucher has no value until presented for redemption in accordance with the Conditions of Issue. The remaining Voucher cannot not be sold, refunded nor redeemed for cash in any case. Should the Voucher appear damaged, deformed, torn, cut, drilled or in any way altered, or in case of loss, the Company or the hotel reserves the right to cancel or refuse to accept the validity of the Voucher. You are not entitled to compensation under these circumstances. You shall not, or shall not allow anyone to, affix, print, attach or place any markings, stickers, objects and/or any other material onto the Voucher (unless such markings, stickers, objects and/or any other material is approved by the Company) or to otherwise alter, remove and/or change any reference numbers, words, notices, trademarks, trade names, artwork or design on the Voucher. You shall not, or shall not allow anyone to, affix, print, attach or place any markings, stickers, objects and/or any other material onto the Voucher (unless such markings, stickers, objects and/or any other material is approved by the Company) or to otherwise alter, remove and/or change any reference numbers, words, notices, trademarks, trade names, artwork or design on the Voucher. The Company reserves the right not to replace or refund the Voucher in the case that the Voucher has been lost, stolen, destroyed, damaged, scratched, notched, torn, cut, drilled or punctured and the Voucher will be void if expired, altered, photocopied or reproduce. The Company is no responsible for failing to redeem an accommodation at the participating B2 Hotel as listed on the Conditions of Issue the Voucher. 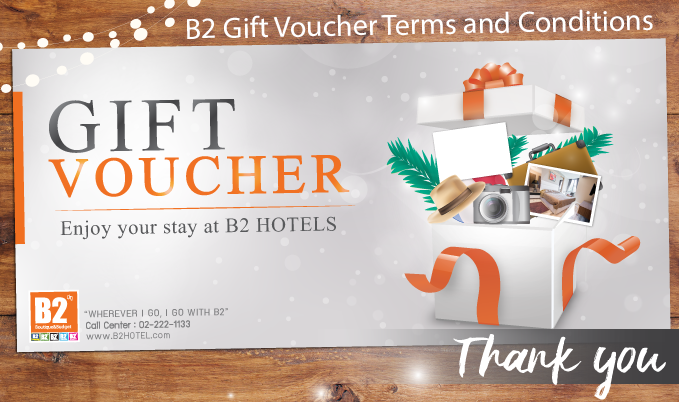 If you have any further question about the Voucher, please contact B2 Customer Service Center at 02 222 1133 or email us at sales@b2hotel.com daily from 08:30 a.m. – 05:30 p.m.